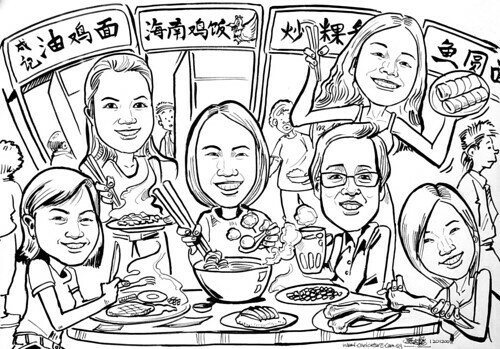 Farewell caricatures for the lady in the centre. She will be leaving for United Kingdom, and stays there for good. Her colleagues wanted a casual theme. They proposed to have a hawker centre setting, with them enjoying local foods like Char Kuay Teow (炒米果条), Cai Tau Kuey (菜头米果), Hainanese Chicken rice (海南鸡饭), Teh Tarik (拉茶), fishball noodle (鱼圆面), BBQ chicken Wings etc. However, without colours, it is difficult to tell and differentiate them. I have proposed to them, but they wanted in black and white (ink). When the client collected this artwork form my shop, she saw my samples and those artworks ordered by other clients. She said the colour caricatures looked better. It is too late, not only that they need to give it to her the next day, but also because that I have used Indian ink for the caricatures. This ink is ideal for the 'Hero' branded fountain pen, as it is smoother (more diluted and thus not as black as the Chinese ink). Once the colour marker goes over it, the ink may smudge a bit. Hey Jit nice work my friend - you haven't moved to a Wacom yet ? Using it occasionally for illustrations, but not for caricatures. Takes longer time for my case. Limited market for digital caricature illustrations here too. The clients just need caricatures to be done, irregardless of the medium. Budget contraints too.